Part I - A Very Long Diversion into the Embrace.. The tango embrace is my greatest source of pleasure from this dance. It is also my greatest frustration. Every leader is different, and so is every teacher. 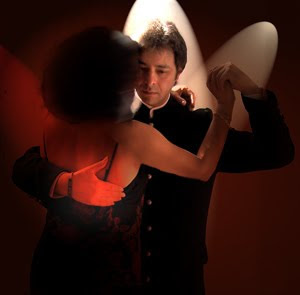 My most negative experience in a tango workshop was being told in front of an entire class that my embrace was (in much harsher terms than this) unacceptable. Even as I was being corrected and told to keep my hand on the leader's right shoulder blade, I felt like the corrected embrace was not very comfortable for me, especially as my partner at the time was shorter than I was. But I did what I was told. In that embrace I had the option of my elbow jutting out (creating a gap between the bend of my elbow and my leader's shoulder) or pulling my elbow in and down, thereby restricting the movement of my leader's right arm. I kept as light as I could, so that I wouldn't weigh his arm down, but I still felt a little more disconnected and like I was constantly lagging behind the lead. This is an example of the embrace I was taught in that workshop (by different teachers then those below): pictured here Daniel Nacucchio and Cristina Sosa (from Zazzle.com) of the shoulder blade contact, with elbow down. It's beautiful, but feels so awkward for me with several of the leaders I dance with most regularly. With other leaders the shoulder blade embrace worked a little better - especially if the leader was taller and broad through the shoulders. But for the majority of my leaders, it's hard to feel the connection all the way through my left arm. For me, this embrace make it easier to keep my ribcage lifted, and keeps me from accidentally weighing on, or restricting, my partner's right arm. But every teacher is different and every leader is different. I adjust my embrace as much as I can according to the preference of my leader. And the best advice I've gotten regarding which embrace is better is "whatever your teacher says it is for the duration of the class." After that, you have to negotiate it with each partner. Both Daniela and Grisha emphasize that the embrace is also not a static thing - but a dynamic structure that adapts to what the movement and music requires. And then there's that "invisible plane between dancers" thing . . .
Several teachers, and leaders, have emphasized that we never get into, or violate each other's space in that regard. Whatever the distance is, set by the leader, it's divided in half and neither one moves into, or collapses, into the other. When I was taught this, it certainly did seem logical enough. It was just hard to maintain, and I was constantly getting reminded by my teacher at the time to maintain it. Not only did this become somewhat less relevant in milonguero style embrace that I learned later, but it also didn't seem to hold completely true for me in other embraces with other dancers. There seemed to be plenty of times when that "plane" was not maintained to be able to do more dynamic movements. In fact maintaining the rigidity of that plane sometimes made the dance uncomfortable for me. It felt like it was putting pressure on my shoulder blades and the middle of my back - depending on who I was dancing with. On the other hand, I noticed that when I danced with a few leaders who very slightly kept my hand just a little bit more into "their space" - I was much more comfortable. The pressure was relieved on my shoulders - but I never felt "pulled" into their space. It's a very slight difference, but it feels much more comfortable. When I had my lesson with Grisha, I noticed that his embrace, and where he kept my right hand, made my back feel less tense almost immediately. I had tried to explain something I felt in a blog post back in October 2009 , when I first experimented with laying my arm more broadly across a leader's back. What happened was not only was I able to feel my partner's lead more clearly in his torso, but I was also able to feel the muscles in his back engage. In a sense, I was getting information from both sides of the man in front of me. It was incredibly difficult to describe then, and not much easier now. But during my lesson with Grisha, it was something he pointed out and emphasized. Every where that our bodies are connected, we are getting important information. And while we always feel for the lead and intention through the torso as the leader moves forward, each leader engages the muscles in his back and shoulders differently. It's not that I can explain what the muscle movement means - or how I need to interpret that movement, it's just an awareness that helps me build a picture of the way he moves. No matter how many times I read that last bit, it doesn't seem to get at what I'm trying to say. I'll just leave it for now and work on it later. I welcome, as always, any thoughts on the subject. Anyway that's probably enough for now. Time to decipher more of my notes. I recently posted about the embrace that you described, and how some instructors apparently are telling the followers to use their back muscles to get a connection, resulting in a painful choke hold :( I much rather have my follower embrace me in a more hug like manner. As for the other point about the follower's right arm, I took several classes with Diego Di Falco & Carolina Zokalski recently, where they emphasized that very point. I used to think Diego's left hand placement looked funny , but when he explained it, it made a lot of sense. His argument is that it's more comfortable for the woman, more comfortable for the man (as long as he keeps his shoulder relaxed), but also helps the woman maintain the connection by making it less likely that her arm will collapse. Thank you for your comments El Ingeniero! Since I'm not sure which embrace you're talking about that I described, since I described two, I can only speculate on what it means to use back muscles to get a connection. It sounds a bit painful from both sides actually. 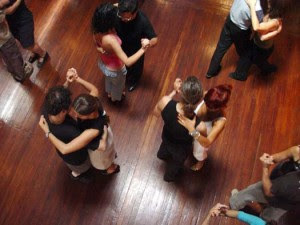 Grisha (and Daniela Arcuri, the teacher who brought Grisha to Austin for a short time) emphasized that the follower should feel "light", with her back responsive, but relaxed, as it is when it's rounded slightly as opposed to "gripping" the leader anywhere - regardless of where her left arm is. Diego Di Falco and Carolina Zokalski are just beautiful! I love to watch them, and how they feel and express the music - gorgeous!